Old English Tumblers come in a variety of colors, including black, yellow, red, muffed and saddle marked. As is typical of tumbler pigeons, they are said to be quite acrobatic as they execute backward somersaults in flight or on the ground. 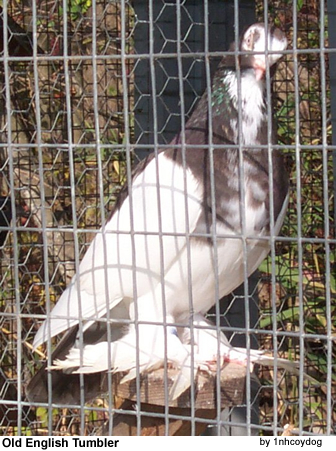 These smaller-sized pigeons generally weigh between 6 - 7 oz (170 - 198 grams). However, these pigeons are mostly used as show breeds and, some argue, may have lost some of their tumbling capabilities as more importance was placed on their physical characteristics when selecting breeding birds rather than focusing on their aerial abilities.